A New Heritage Area in Washington State? Congressman Derek Kilmer of Washington State discusses a proposal to create a Washington Maritime National Heritage Area on Puget Sound and nearby waters. I’ve been monitoring efforts to create a maritime heritage area in Washington State that would cover Puget Sound (including Seattle), the Strait of Juan de Fuca between the U.S. and Canada, and the Pacific Coast of Washington State. This week, two Washington State congressmen, Derek Kilmer of the 6th district and Denny Heck of the 10th district, announced their intent to introduce a bill to designate the region’s shoreline as the Washington Maritime National Heritage Area. 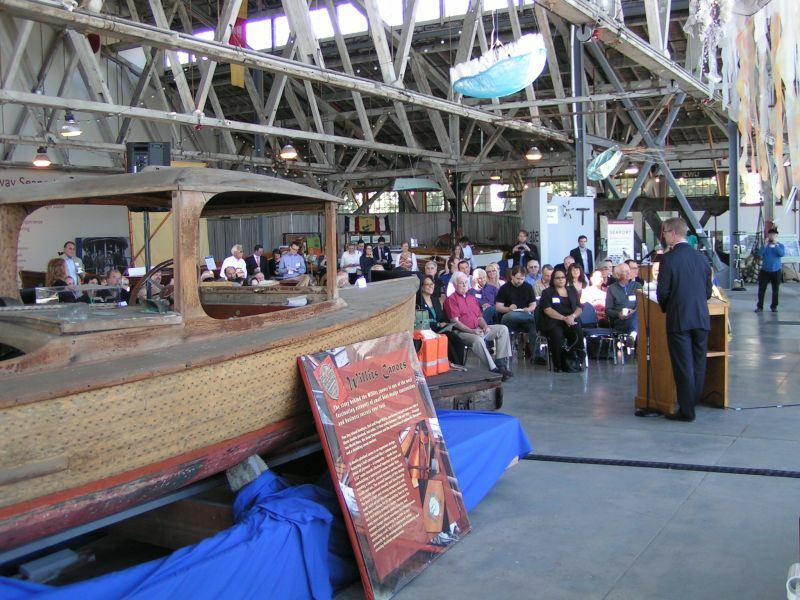 During an event at the Foss Waterway Seaport museum in Tacoma, Washington State’s historic preservation officer, Allyson Brooks, said Sen. Maria Cantwell would sponsor a version of the bill in the U.S. Senate. Maritime heritage enthusiasts and scholars have pushed the idea of a national heritage area in western Washington for about 10 years. If enacted, the area would fall under the National Park Service’s Heritage Area program, which oversees 49 similar areas across the U.S., mostly east of the Mississippi River. The areas promote local economic growth and preserve sites and landmarks with cultural and historical significance. Each area is managed by local officials, with no new regulatory authority over management or preservation given to the National Park Service. Washington State supporters see a heritage area as a major tourism draw, especially to rural counties. A small amount of money for promoting the area comes with the designation. The Kilmer/Heck/Cantwell proposal raises the profile of a heritage area in Washington State, but the legislation’s immediate prospects in Congress are dim. The Republican-controlled House opposes any new law perceived as an extension of federal power, no matter how benign. A heritage area is mostly an honorific, and as Brooks pointed out several times, carries no new regulatory authority. Opponents have prevailed so far. For example, a proposal to create a similar area around the mouth of the Columbia River failed after conservative local residents used the weak, but effective “slippery slope” argument: If you let the feds declare a heritage area, what’s to stop them from confiscating your land, taking your guns, making you sign up for Obamacare, and similar silliness. The GOP wants to reform the law governing heritage areas, but a bill to do just that is stuck in committee, and the website GovTrack.us gives that measure an 11 percent chance of passage. Even state lawmakers are leery of the idea of a heritage area; A measure in the Washington Legislature to designate a state version died in the state senate earlier this year. Despite the good a maritime heritage area would do for local communities, DC politics will likely keep the idea on the back-burner for a long time. Cantwell might be able to push a bill through the Senate, but the House is another matter entirely. Kilmer and Heck are Democratic newcomers to Congress, and their influence is limited. It’s going to be a case of introducing legislation every year until the Congress moves left or the supporters get lucky enough to find a majority. Disclosure: I’m communications director for Grays Harbor Historical Seaport Authority, which could benefit from a maritime heritage area. Opinions expressed here are my own.